Policymakers need short, easy-to-read information to help them spot opportunities, prioritize action and make decisions. 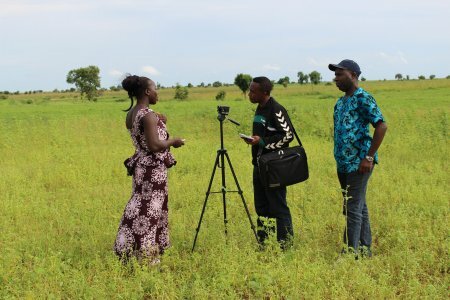 Responding to this, CCAFS scientists produced a set of visually engaging and highly factual profiles of the current state of climate-smart agriculture in 12 countries and counting. The profiles, for countries in sub-Saharan Africa, South Asia and Latin America, sum up challenges to agriculture and how climate-smart practices can help adapt to climate change and mitigate its effects. They are the product of months of in-depth research reviews, findings from surveys and responses to interviews with country experts. Developed by researchers from the International Center for Tropical Agriculture (CIAT), and partners at the World Bank and Centro Agronómico Tropical de Investigación y Enseñanza (CATIE), Costa Rica, the profiles differ from country to country. The profiles of some countries provide information on the opportunities that are available and actions that could take advantage of the opportunities. The profiles of other countries look at policies, plans and actions underway, showing what has been achieved and what remains to be addressed. The country profile for Kenya, for example, shows that livestock generate 96.2% of agricultural greenhouse gas emissions, information that points to the livestock sector as a promising area for introducing climate-smart practices. The Rwanda country profile shows that only a few farmers have adopted climate-smart practices, indicating a clear need for incentives. The profile for Sri Lanka shows that there are synergies between research, development and extension programmes. Such synergies can facilitate and support the adoption of climate-smart technologies and practices that mitigate the effects of climate change and raise productivity. The profile for Uruguay shows that bilateral and multilateral international financial institutions already cooperate with Uruguay in initiatives related to climate change. Although none of this cooperation specifically addresses climate-smart agriculture, it presents opportunities to adapt agriculture to become more resilient. What is clear from the research underpinning the profiles is that climate-smart agriculture is not a package of solutions, but an approach that helps a country to transform and reorient agriculture to support development and ensure food security in a changing climate. Because countries are at different stages of development and tackle development in different ways, the profiles will help guide different pathways towards climate-smart agriculture. Further profiles are now being developed at the request of countries, including profiles of sub-national districts.